In 1957, the Reverend Ralph H. Kimball and the Vestry of St. Andrew’s Episcopal Church founded St. Andrew’s Episcopal School, the first Episcopal school in Orleans Parish. With each passing year, a grade was added until a sixth grade completed the program. In 1965, 12 students graduated from St. Andrew’s, its first group of 6th graders. In 2007, St. Andrew’s added a 7th grade, and in the spring of 2009, 11 students graduated from the 8th grade. In 1985, St. Andrew’s Episcopal School was accredited by the Independent School Association of the Southwest (ISAS). The school is also a member of the National Association of Independent Schools (NAIS), the National Association of Episcopal Schools (NAES), and the Southwestern Association of Episcopal Schools (SAES). 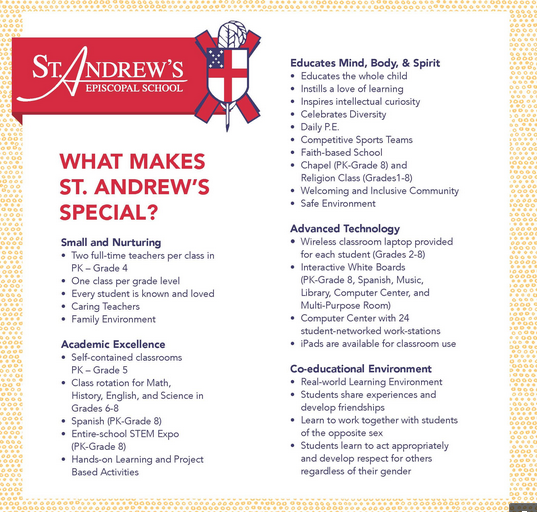 In August 2015, St. Andrew’s Episcopal School expanded its ministry to include the St. Andrew’s Cottage (ages 18 months-3 years). In August 2018, another three-year-old class was added. Today, St. Andrew’s Cottage has 4 classes comprised of 2 two-year-old classes and 2 three-year-old classes.